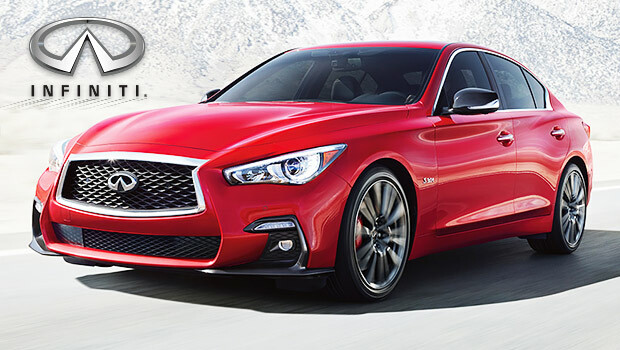 SellAnyCar.com – Sell your car in 30min.Face-lifted 2018 Infiniti Q50 with Twin-Turbo V6 Engine and Updated Safety Features - SellAnyCar.com - Sell your car in 30min. Coming with mid-cycle refresh, the 2018 Infiniti Q50 is ready to stun the sedan enthusiasts with its stylish new front fascia and a revamped interior. Revealed at the 2017 Geneva International Motor Show, the 2018 Q50 brings consistency in its performance while promising a better-looking exterior. The compact sedan will have new driver assistance features, multiple engine options (including a hybrid version), a better interior and new trim names to become more attractive to those who are looking to buy a sedan that ticks all the boxes for performance, utility and aesthetic appeal. 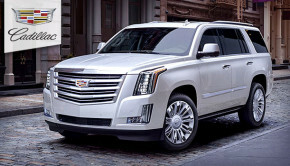 Two trim levels have been renamed, now the basic trim is called Pure while the Premium trim level is renamed as Luxe. With a fresh new front fascia and a more comfortable interior, the 2018 Infiniti Q50 has evolved and is a sight to behold. Thanks to its features such as Direct Adaptive Steering, the performance of the vehicle is just as good as it looks. Here is a review of the all-new Infiniti Q50 with a closer look at its new updates, design, performance, safety features and a lot more. Pushing the limits of sedan aesthetics, the 2018 Infiniti Q50 has a more refined and stylish exterior than ever before. 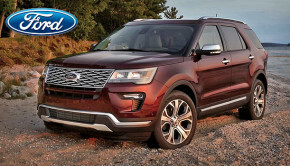 The front of the vehicle has received the majority of upgrades for the exterior, while the interior has also been updated to make it more luxurious and welcoming for the driver and the passengers. 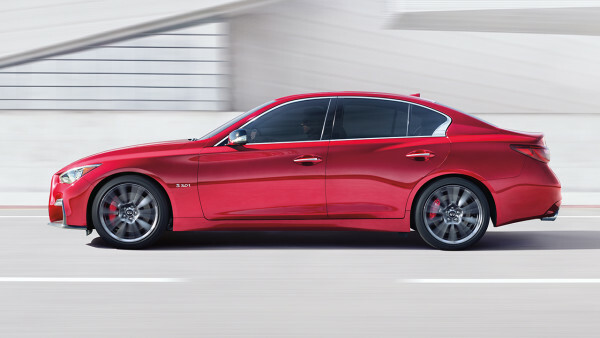 Face-lifted to perfection, the 2018 Infiniti Q50 receives plenty of upgrades to be prominent yet at the same time, retain the Infiniti elegance. The first thing to notice about the front-end is the new grille, it is now sharper at the edges rather than rounder, which makes the exterior look a lot cleaner than before. 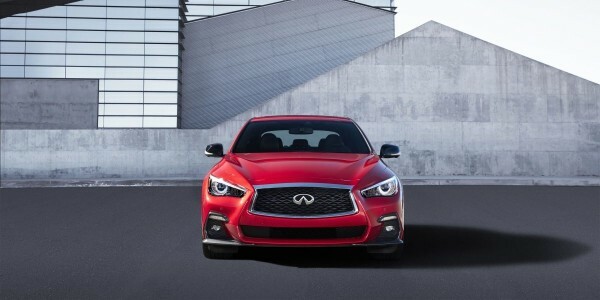 To complement the new grille, the designers at Infiniti have made the air intakes below the grille taller and wider. One thing to notice about the new air-intakes is that they are now a part of the front-fascia rather than being integrated into the front lip. Both the front and the rear bumpers have been reshaped to fit with the new design and styling better. 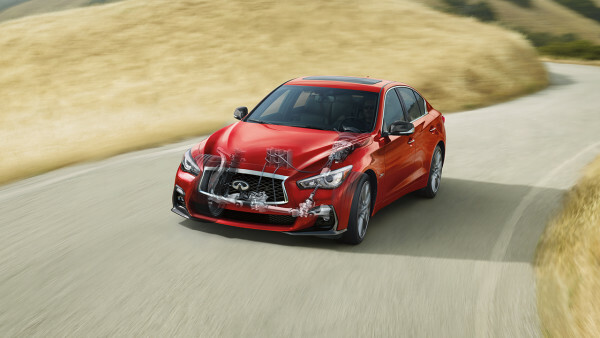 The distinctive two multi-mode jeweled headlamps with LED daytime running lights are still present at the front of the vehicle to preserve the signature Infiniti style statement. The flowing lines and the sculpted fenders are still present in the styling so that it still looks athletic. The muscular fenders add to the broad-shouldered look of the vehicle that stuns the onlookers even when it is standing still. The stance of the 2018 Q50 is wide and low so that it gives a sporty feel that goes hand in hand with the Infiniti’s exterior appeal. The artful crescent shape of the windows with chrome accents make the windows look beautiful and offer better visibility to the rear passengers. The eye-catching design and the dramatic stance of the sedan are further enhanced by the 17-inch split-spoke wheels fitted with all-season performance run-flat tyres that make the exterior look contemporary and elegant. Whereas, the overall aerodynamics ensure that the sedan receives less air resistance so that it can cut through the air more fluidly than ever before. The interior of the 2018 Infiniti Q50 has been revamped to bring a more comfortable and luxurious cabin experience to the driver and passengers. The cabin of the sedan has been updated to bring out the inner beauty of the design and make it stand out. The use of optional features such as contrast stitching, Japanese-inspired Kacchu Aluminum trim, and semi-aniline leather ensures that the passengers are comfortable and enjoying the ride at all times. To begin with, there is a new steering wheel that is inspired by the Q60 Coupe. The leather-wrapped, 3-spoke steering wheel and the shift knob are placed strategically so that they are in the easy reach of the driver. To enhance the comfort of the passengers, the 2018 Infiniti Q50 is fitted with dual-zone automatic temperature control to make the atmosphere in the sedan perfect for every passenger. The cabin is covered with Lunar Black trim and also offers the choice of new wood trim options. The seats are upholstered with leatherette seating so that the passengers can enjoy the ride at all times. The driver and the front seat passenger will enjoy 8-way power adjustable seats, while the driver will also have adjustable lumbar support. As for the in-cabin technology, the 2018 Infiniti Q50 features 6-speaker audio system, 2 USB connection ports, SiriusXM Satellite Radio, dual digital display system screens that include an 8-inch LCD/VGA upper screen and a 7-inch lower color vehicle-information display. Features such as INFINITI Voice Recognition, Bluetooth and Cruise Control are standard on all trim levels. 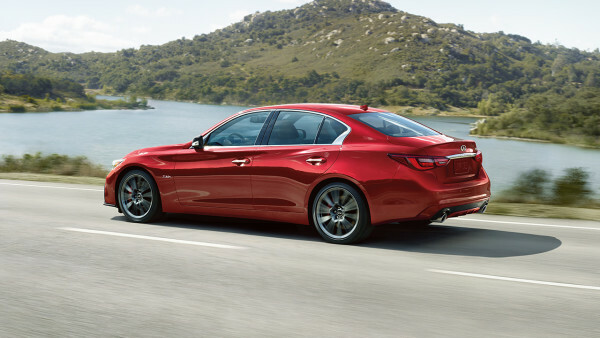 The performance of the 2018 Infiniti Q50 stands it apart from other sedans in the segment. The all-new Q50 comes with three engine options and with a separate trim level for the hybrid powertrain. It is a rear-wheel drive sedan, however, it is available with all-wheel drive as well. The first engine available is the 2.0-litre I4 Turbocharged engine with aluminum alloy block and heads. This engine can produce 208 horsepower and a torque of 258 lb-ft. 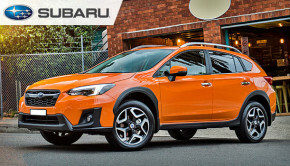 It is paired with an electronically controlled 7-speed automatic transmission and offers a fuel efficiency of 23mpg in the city and 30mpg on the highway. The second engine available is a 3.0-litre V6 twin-turbocharged engine with aluminum alloy heads and block. This engine is capable of producing 300 horsepower, 295 lb-ft of torque and is paired with the same 7-speed automatic transmission. 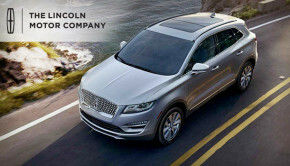 It offers a fuel efficiency of 20mpg in the city and 29mpg on the highway. The Red Sport 400 trim level uses the same 3.0-litre V6 engine, however, in this high-performance trim, the engine produces 400 horsepower, 350 lb-ft of torque and is paired with the same 7-speed automatic transmission. As for the Hybrid trim level, the 2018 Q50 has a 3.5-litre V6 engine with INFINITI Direct Response Hybrid technology, a 50 kW electric motor and offers a fuel efficiency of 27mpg in the city and 32mpg on the highway. This 3.5-litre engine can produce 360 horsepower, 258 lb-ft of peak engine torque and 214 lb-ft of peak electric motor torque. The hybrid trim level also comes with the Eco Pedal Mode that provides instant feedback to the driver through pressure on the accelerator pedal and an indicator light on the instrument panel when the driving style is not optimizing the vehicle fuel efficiency. 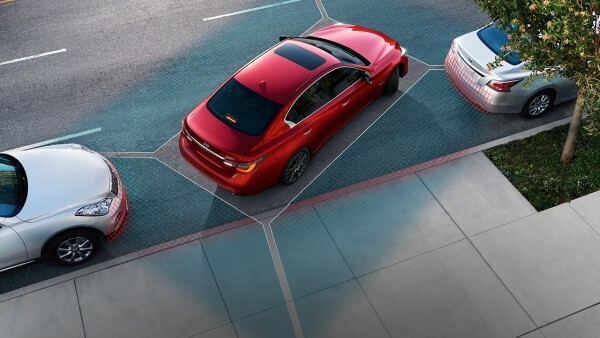 The 2018 Infiniti Q50 is fitted with some of the best and advanced safety features, which ensure that the vehicle is safe at all times and in every driving condition. Infiniti has also added some new driver assist features in the new Q50. The 2018 Infiniti Q50 is expected to reach the UAE car markets by early 2018, however, its price has not been announced for the UAE region. The price of this stylish sedan is expected to be announced near its launch in the UAE. In the USA market, the 2018 Infiniti Q50 has a starting price of $34,200. If you are planning to buy a new vehicle with advanced safety technologies and improved performance features, then don’t forget that with us, you can sell your used car fast in just 30 minutes while all the post-sale paperwork is handled by SellAnyCar.com’s team.